If you read my blog frequently, then you know that we are big Doctor Who fans. Pretty regularly, we've had a fellow Whovian join us for dinner and Sci-Fi on Saturday nights. The first time we did this, I wanted very much to make something that was somehow related to Doctor Who. What I found was this delightful recipe for a bow tie pasta salad. Yes! I know! Bow ties for watching the Doctor, it really did seem brilliant. And the salad was really good, to boot. I made it once with bacon as the meat, and once with chicken. While I generally prefer chicken in things, I think the bacon pulled the flavors together better. In the last year or so, it has become apparent that Clayton can't eat dairy like he used to. We don't have to cut it out completely, but I am trying to cut back on it. Once I realized it wasn't as simple as not cooking with cheese, I started doing more research. This was inspired by a recipe I found in the book Cooking for Isaiah, by Silvana Nardone. I didn't have all the same ingredients, so I had to improvise a bit. All the same, I'm grateful to Silvana for even suggesting that something as creamy and comforting as corn chowder could still be enjoyed in a dairy-free household. When I saw this recipe for Snickerdoodle Brownies on Pinterest, I knew they were the perfect Valentine's Day treat for Clayton! His favorite cookies are snickerdoodles, so I thought this recipe might be his new favorite dessert. 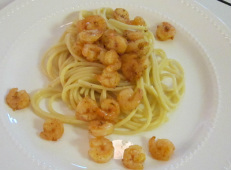 Just looking over the original recipe at frugalanticsrecipes.com, I saw some great opportunities for a couple healthy substitutions. So this is my adapted version. Even with the substitutions, they came out really well. Clayton was so pleased with them, that he says it might just redeem cake in his eyes (he's not a cake guy). If you want to see the original recipe, click the link above. If you don't have an awesome Kitchenaid mixer like I do, a potato masher works really well for creaming together butters and sugar. According to Pinterest and the rest of the internet, one can simply put shredded potatoes into a waffle maker and enjoy simple, crispy hash browns. I tried this, but didn't like how the potatoes didn't stick together when coming out of the waffle maker. Maybe it's because of my huge Belgian waffle maker? At any rate, it inspired me to make this beauty of a recipe, which someone else has probably tried at some point, but which I'm proud to call my own. It has two ingredients, and it's way less messy than regular waffles. Even with the machine set to crispy, the insides will be light and fluffy. I like to serve these with ham and applesauce. When we hosted Dave and Rachel and Richard on Richard's one and only night in North Carolina (before taking off for New York, and then Okinawa, Japan), I knew I wanted it to be extra special. A special evening with family was the perfect excuse to try another Pinterest recipe. This treat is strong and tasty. Rachel and I were brainstorming other awesome applications, which might turn up around Christmastime. If you're looking at my "shot" glasses funny, I totally understand, since we don't actually have shot glasses, but we do have several many boxes of wine glasses left over from our wedding. Here's the link to the original recipe on All Recipes. As the dessert for our Independence Day picnic, I made chocolate cherry cola cupcakes. I got the idea to do this from Better Homes and Gardens, which calls their recipe "Fourth of July Cherry-Cola Cake", and instructs you to make it as a layer cake. The picture on BHG looks charming enough, but this picnic had to be portable, so I adjusted the recipe to make it into cupcakes, which were much easier to pack and serve. 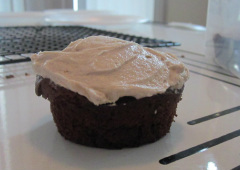 For the icing, I modified the "Quick White Icing" recipe from Joy of Cooking. The centerpiece of our picnic this Fourth of July was a grilled chicken and avocado wrap. It turns out, wraps are perfect picnic fare. They don't get soggy as fast as sandwiches, and everything is wrapped up all tight and neat. Also, we didn't even need the plates we'd brought. For all those reasons, and the fact that they're delicious, these wraps are a great choice for picnics. 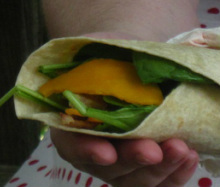 Another blogger has a slightly different wrap recipe, which includes a really nice sandwich wrap diagram. Check it out here. When I saw a picture on Pinterest of a chicken breast being rolled up with a mozzarella stick inside, I had to try it. Actually, I made this without consulting the original recipe. I just seasoned it they way I knew my husband and I would like it, and then rolled it up with that cheesy goodness. Here's the link to the recipe whose picture inspired mine. We had ours on shells with some slices of banana bread. These little tiny shrimp pack a lot of flavor. They're cooked in garlic and a flavorful oil, and seasoned with cayenne for some kick. Lemon juice, which can come from a fresh lemon or from the bottle, adds some zing to the whole thing. As far as I can tell, which pasta you serve this on doesn't matter a whole lot, but I prefer the long, skinny kinds, such as spaghetti or linguine. Come see what's on my table. 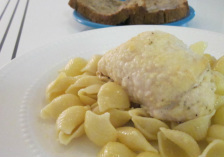 Some of the recipes are my own, other are from blogs, websites, magazines and cookbooks. Feel free to try any of them. Please comment to let me know how you liked a recipe, or make a suggestion for next time.